Based on a True Story from director Roman Polanski was a late addition to this years festival, but I am excited to see what the cast will bring to the red carpet. Eva Green is a dark, vampiress on the red carpet and has had some really beautiful red carpet moments under her belt. While it she can have really great red carpet moments Eva can also be really disheveled. I hope that when it comes time for her appearances at this years Cannes Film Festival that we see some really gorgeous looks from Eva. 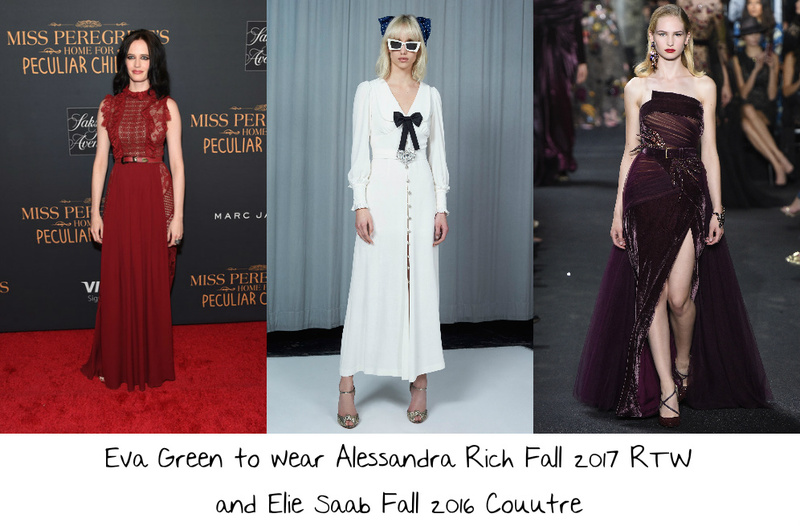 At the photocall for Based on a True Story I would love to see Eva for for 40’s glamour with this white Alessandra Rich Fall 2017 RTW long sleeve, button up midi dress which features a black bow at the plunging neckline and a heart shaped embellishment. I think that anywhere outside of Cannes that wearing this for a photocall in the bright light of day would be seen as too much, but for a photocall at the festival I think that this is a perfect dress for Eva to wear. I think that with her jet black hair in voluminous loose waves, a smokey eye, red lip, and a pair of simple black sandals that this would be a really beautiful look for Eva. For the premiere I upped the glamour even more with this deep purple Elie Saab Fall 2016 Couture strapless velvet column gown which features a belted and embellished waistline, daring split, and a dramatic tulle train. This gown is one of those that I really want to see on the red carpet and I do think that with Eva’s signature dark glamour that she would absolutely kill this gown on the red carpet. Usually we see Eva with loose waves but I think that a sleek high bun, lined eye, dark red lip, and the runways pumps that this would be a really major red carpet moment for Eva on the 2017 Cannes Film Festival red carpet. Fan Bingbing absolutely killed it with the gown that she wore on the red carpet at the opening ceremony yesterday and I am now even more excited to see what the rest of the festival has in store for her. For this wish I went for the most simple of the gowns that I have chosen for Fan to wear over the course of her tenure as a Cannes Film Festival jury member. This light pink Guo Pei Spring 2016 Couture draped column midi gown which features an embroidered neckline and a bow on the hip is beautiful and I think that for Fan that this would be a step out of her norm. I love to see Fan wearing Chinese designers on the red carpet and I think that she would wear this Guo Pei design incredibly on the red carpet. Old Hollywood waves, diamond drop earrings, a silver embellished clutch, lined eye, red lip, and a pair of silver sandals would really make this yet another gorgeous red carpet moment for Fan. The 2017 Cannes Film Festival is open and will run though Sunday May 28, 2017. The premiere of Based on a True Story will take place on Saturday May 27, 2017.